Cool Down For Warmth - Join us for lunch! Congratulations Revel + Roost for winning the 2019 People’s Choice Award! Thank you for joining us for the 2019 Bowls for Warmth Soup Tasting. This event raised more than $20,000, including a match from our utility partners, to assist local families in need. 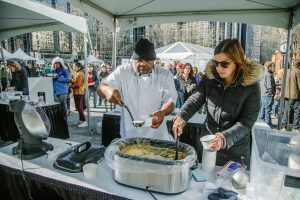 During the 2019 Cool Down for Warmth event, Dollar Energy Fund is hosting a Bowls for Warmth Soup Tasting to benefit families in need of utility assistance. Local restaurants will participate in a soup challenge, serving cups of soup to the lunchtime crowd in Market Square. 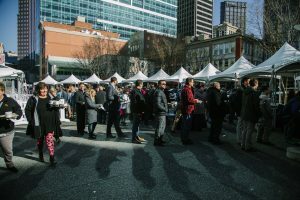 Attendees get to sample three soups from their choice of over a dozen participating vendors, and vote for their favorite! Tickets will be sold for $10 at the Cool Down for Warmth kiosk located in Market Square (cash and credit cards accepted). All proceeds will benefit Dollar Energy Fund’s efforts to keep local families warm this winter. 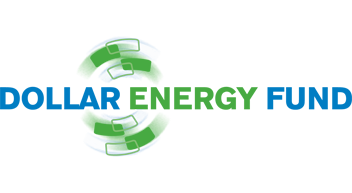 Every donation is matched dollar-for-dollar by our utility partners and your tax-deductible donation will stay in Western Pennsylvania. This is event is made possible through a partnership with BNY Mellon. 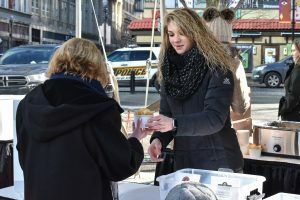 Bowls for Warmth is just one of the events taking place those two days in Market Square during the Cool Down for Warmth event. The event features a full-size ice house with giveaways, music and more! For more information about Cool Down for Warmth, click below.